An American-Iranian pastor imprisoned in Tehran since September may face hanging because of his Christian faith. Saeed Abedini sent a letter to his family Jan. 10 detailing his torture and treatment by Iranian authorities. The U.S. State Department expressed “serious concerns” about Abedini’s situation on Friday. “In a powerful letter from him released to family members in Tehran, Pastor Saeed reveals that he is undergoing beatings and is being told that he ‘will hang’ for his Christian faith. That treatment combined with the recent news that Pastor Saeed’s case has been turned over to one of Iran’s ‘hanging judges’ makes his circumstances more dire than ever,” Sekulow said. Abedini became an American citizen in 2010 after marrying his American wife, Naghmeh Abedini, according to FOX News. The Iranian government does not recognize his American citizenship, though it had enabled him to travel freely between both countries until this past summer. That’s when he was pulled off a bus and placed under house arrest, according to his supporters. 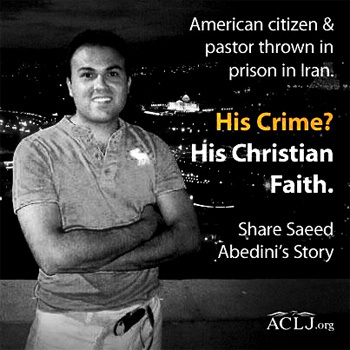 Abedini was then imprisoned and charged with several crimes that have not been made public, but it is widely believed that it is because of his Christian faith. Jihadists and allies of the ruling mullahs target Christians living in Iran.